How to get rid of stress, complete program is perfect for overcoming stress, using a combination of self-hypnosis and NLP for visible effects, after just one listen. Together with the 27 page eBook. How to get rid of stress: This 30-minute self hypnosis mp3 download is perfect for overcoming stress, using a combination of self-hypnosis and NLP for visible effects, after just one listen. Together with the 27 page eBook you will be well on yoyr way to a stress free life. 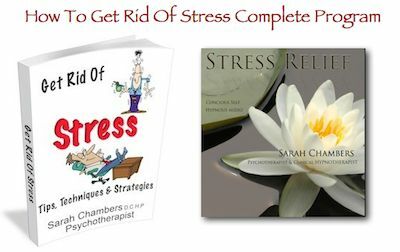 Stress Relief Complete Program MP3 and eBook Symptoms Causes, and Effects.Tips, Strategies & TechniquesFor a Stress Free Life. The mp3 therapy audio begins by talking about our subconscious mind, which controls and maintains your whole body-mind system from the moment you are born, communicating with you through symbolic language. This means that your feelings determine what is essentially reality for your subconscious mind: whether positive and relaxed, or negative and stressed. Explaining that self-hypnosis allows us to become more consciously aware and responsive, the relaxation process begins courtesy of Sarah's warm and soothing voice. The self hypnosis process urges us to absorb our hurts and fears, and focuses on destroying any pain or discomfort that we are currently feeling. Are You dealing with your problem of stress? Stress Relief through creative relaxation, explains Chambers, is the best way to understand our selves and learn to become our own best friend. Sleeping excessively or mindless entertainment may seem like a good way of dealing with stress, but can actually prevent us from dealing with our problems at their roots. Those who suffer from stress have been conditioned into believing that our reactions to the triggers of stress are normal, and this stress relief self hypnosis mp3 has the aim of re-balancing the whole mind and body system, reconfiguring our subconscious to tackle any issues rather than just accepting them and suffering the consequences. Step into a positive attitude. The creative relaxation using this stress relief therapy audio will lead you to be able to bypass your negativity without effort, and tackle situations and problems head on with a positive attitude. By encouraging us to visualise ourselves dealing with stressful situations in a positive way on an ongoing basis, alongside the recording, Chambers claims that we will be able to restore our mind-body balance. A recording that certainly leads to a subconscious shift in thoughts, feelings and behaviours after just one listen, but also a recording that can be revisited time and time again for yet further benefit. A must listen for anyone who suffers from stress, whatever the cause.